Collaboration between the Endangered Habitats Conservancy, the San Diego Association of Governments and the U.S. Department of Defense has resulted in the preservation of a 410-acre property in East County that’s home to valuable habitat and wildlife, including a population of the threatened coastal California gnatcatcher. The property, known as Lakeside Downs, is located west of state Route 67 (SR 67) in the unincorporated Lakeside area, just outside of Santee’s conservation boundaries and about three miles from Marine Corps Air Station (MCAS) Miramar. Previously proposed for a 140-home development, Lakeside Downs contains coastal sage scrub habitat and extensive stands of spiny redberry, host plant for the rare Hermes Copper Butterfly. The property is strategically located, helping to close gaps between lands that are conserved or proposed for conservation. Through its TransNet Environmental Mitigation Program (EMP), SANDAG contributed $4 million toward the $8 million acquisition. The TransNet EMP is funded by the regional half-cent sales tax for transportation approved by voters countywide in 2004. The U.S. Department of Defense (DOD) also contributed $4 million toward the acquisition cost under its Readiness and Environmental Protection Integration (REPI) Program. The Lakeside Downs acquisition preserves important habitat beyond the boundary of MCAS Miramar for the California gnatcatcher, which is federally listed as a threatened species. By doing so, the acquisition reduces on-station conservation pressures and restrictions on military readiness training. The Endangered Habitats Conservancy (EHC) worked together with all the partners to put together the acquisition and is now the owner and manager of the land. The conservancy purchased Lakeside Downs from Helix 1960 Ltd. and Helix Land Co. Ltd. It closed escrow on the property on Aug. 30. 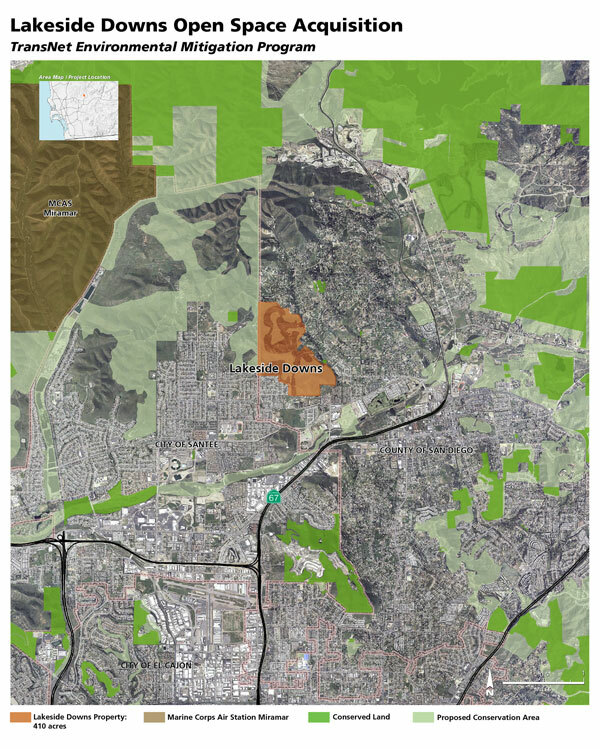 SANDAG and the Department of the Navy, on behalf of the U.S. Marine Corps, hold conservation easements over the property, ensuring long-term preservation.